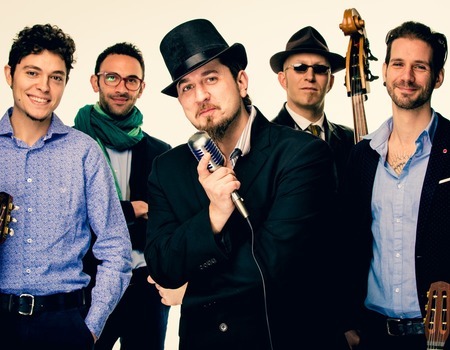 The soul of Gypsy Dynamite: Filippo Dall'Asta and Giulio Romano Malaisi explode onto stage with sizzling guitar, unique and fresh arrangements of traditional Gypsy swing, Italian and Spanish music and memorable 'million sellers'; Gypsy Dynamite style! The band was originally formed as a duo by Malaisi and Dall'Asta in London in 2012, but then expanded very soon after teaming up with bass player Jonny Gee, drummer Daniele Antenucci and singers Dom Durner and Francesca Confortini. Over the years, Gypsy Dynamite has had incredible responses from every crowd that they have entertained all over Europe including France, Italy, UK, Malta and Germany.